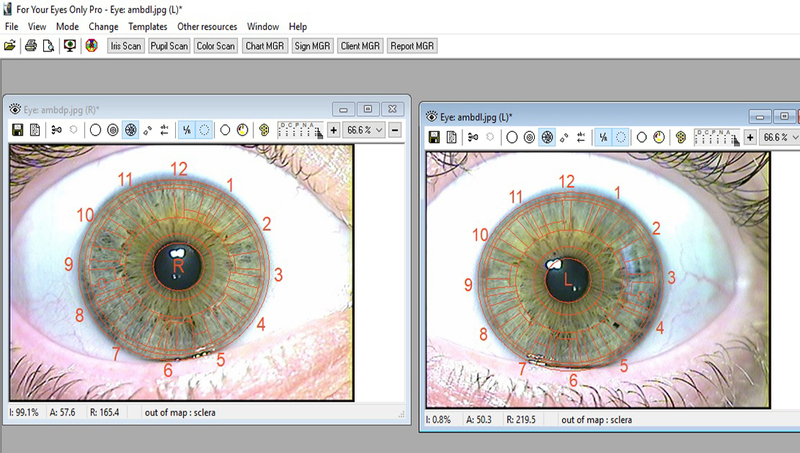 For Your Eyes Only (FYEO) BASIC Iridology software provides tools for the iridologist to allow for analysis of the iris, pupil and sclera through the scanning of the iris for color intensity and setting up and printing iridology reports easily and quickly. 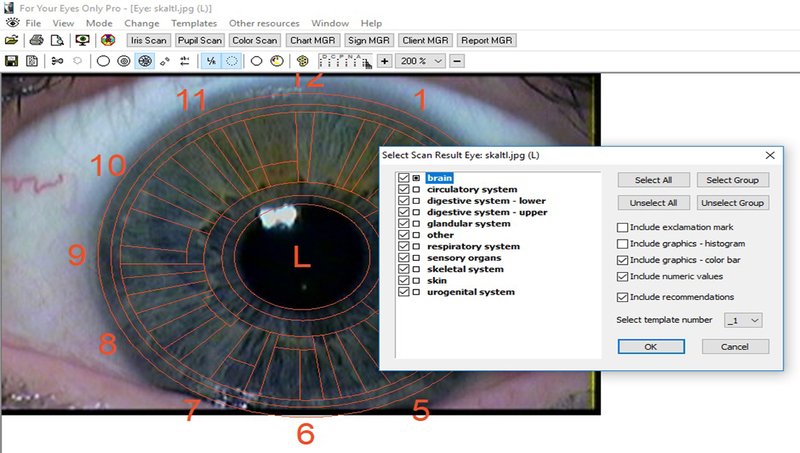 FYEO I-Scan function – within seconds the software scans the iris, takes an average iris color intensity and then calculates a positive or negative value for each organ segment displaying graphically and numerically whether the organ state is acute, normal, pre-chronic, chronic or degenerative. Recommendations in your chart templates (software comes complete with general recommendations but you can custom insert your own) will be automatically added whenever the scan readings are below or above normal levels. All this information is added to your iridology report by clicking on Instant Report. 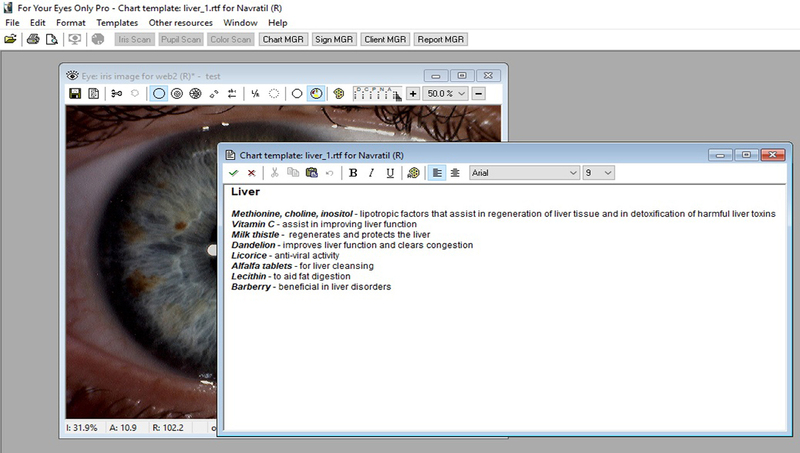 FYEO Chart Manager – a link between the iridology chart overlay and the report. This provides data templates for each organ area of the iridology chart. It allows you to use the pre-installed recommendations for each body organ or custom input your own treatments or recommendations, diets, herbs, vitamins etc. All this information shows up in your report instantly when you click on Instant Report. 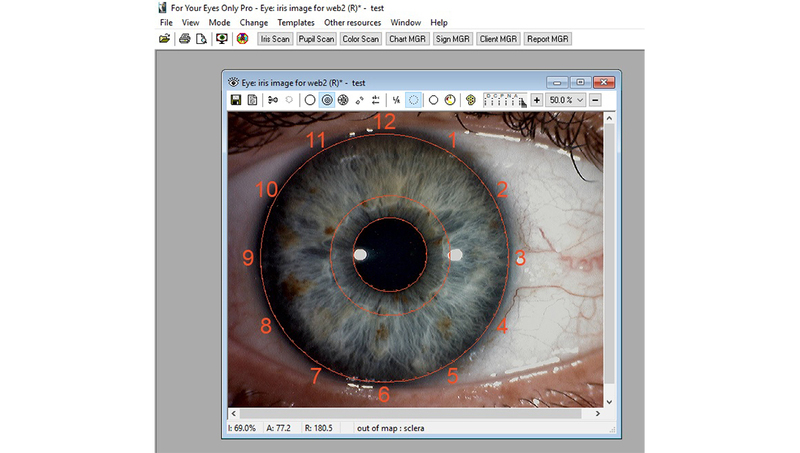 FYEO instant organ identification – never get lost when looking at the iris. At any time just click your mouse on any area of the iris and the body system and organ will be instantly identified or as you move your mouse around the iris you can see the body system and organ in the lower menu bar. 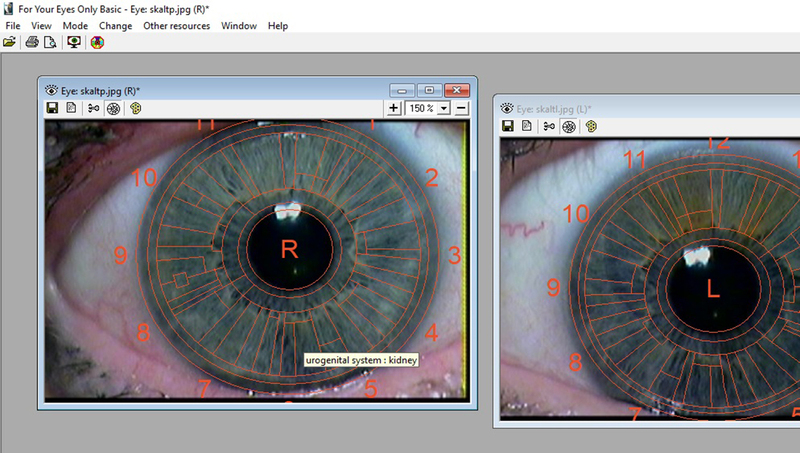 FYEO Instant Report – creating iridology reports has never been so easy even if you know nothing about iridology. The Instant Report function automatically produces a report in seconds. 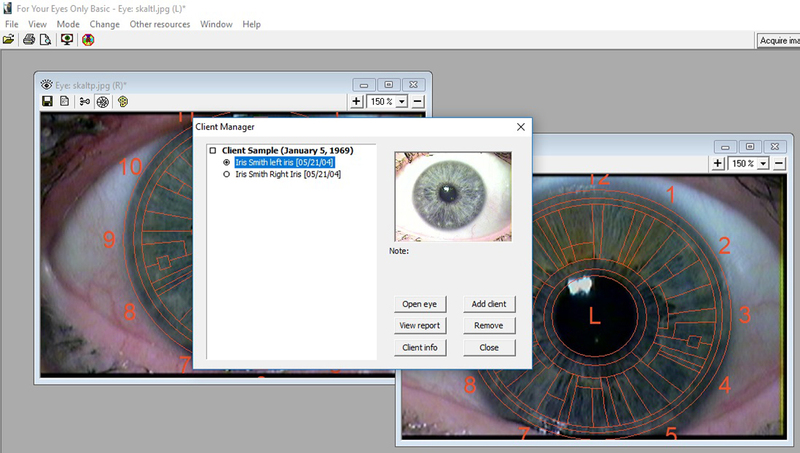 This report includes client details, their iris images, scan results and recommendations for both right and left irises. Perfect for the herb, vitamin or health food storeowner who can produce a quality report for his or her clients that will indicate weak areas of the body, and provide recommendations for these weak areas. FYEO Client Manager – manage your entire client database with one easy software tool. The Client manager function allows you to store unlimited data on each client, including their scan results, reports, images, personal data, notes, treatments etc. 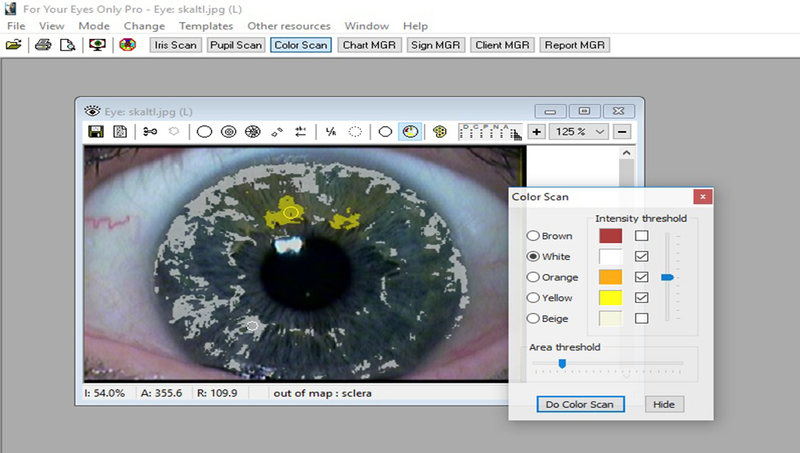 You can at any time, quickly look up any past client and view their irises, reports, scan results and other data. Managing your client database has never been so easy. The previous version FYEO New Millennium indology software took us 5 years to develop. At the time of its release, it was the most innovative iridology software in the world and still to this day continues to be the leading iridology software used by health professionals and professional iridologists around the globe. We decided it was time to make it even better. We decided to invest another 5 years. Our goal: to develop iridology software that would remain miles ahead of anything available in the world for many years to come. There is now no need to look for anything better. It just does not exist. 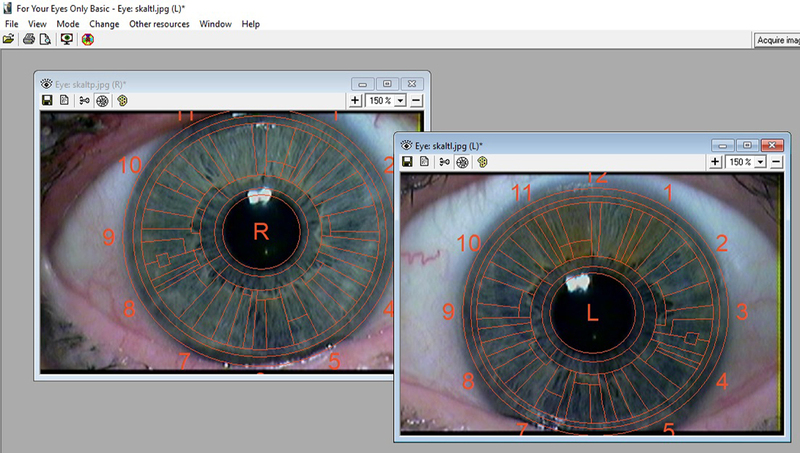 FYEO PRO – Computer Assisted Chart Overlay (CACO) – the software automatically recognizes the iris and overlays a chart automatically with minimum adjustment. FYEO PRO – Autonomic Nerve Wreath Draw Tool – allows the user to use their mouse to quickly outline the exact border of the autonomic nerve wreath /ruff zone allowing for incredible accuracy for the iris scan and sign identification. 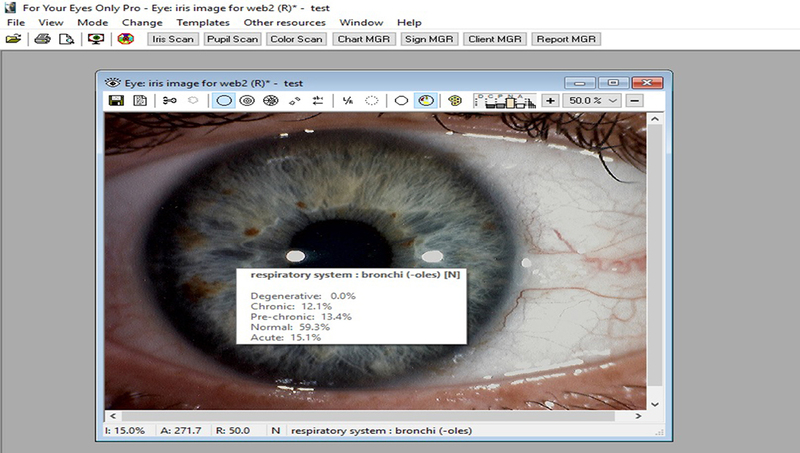 FYEO PRO – Iris Scan – within seconds the software scans the iris, takes an average iris color intensity and then calculates a positive or negative value for each organ segment displaying graphically and numerically whether the organ state is acute, normal, pre-chronic, chronic or degenerative. You can also choose to add the recommendations in your chart templates to be automatically added whenever the scan readings are below or above normal levels. 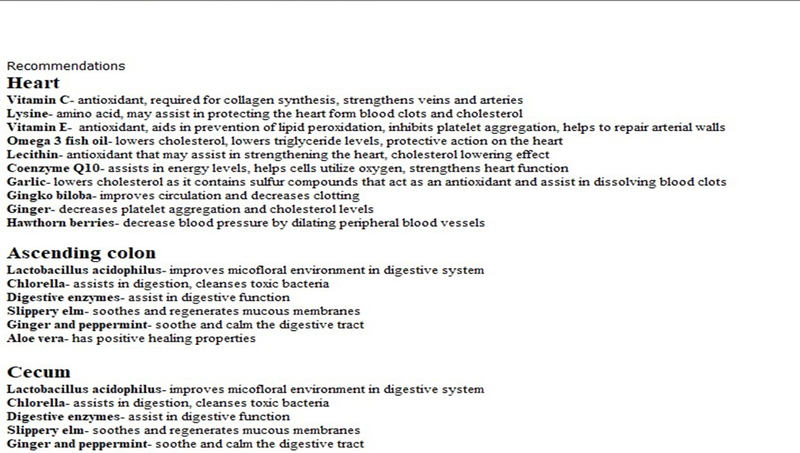 All this information can be added to your iridology report instantly. 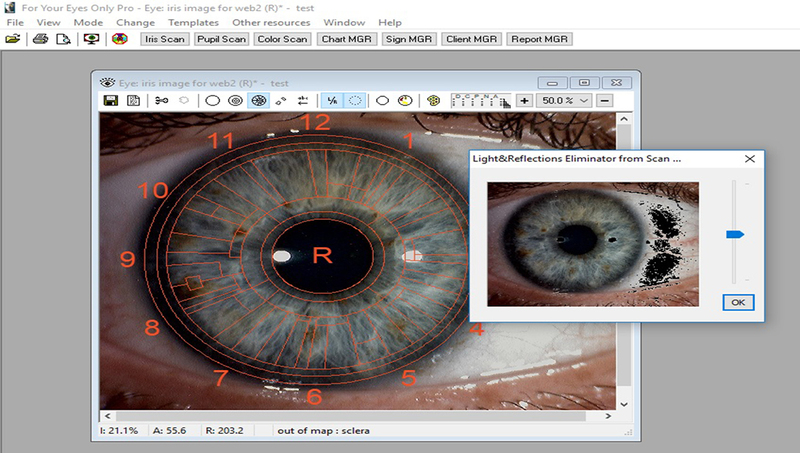 FYEO PRO – Light and Reflections Eliminator – the software automatically recognizes reflections from lights and windows that show up in your iris image and allows you to eliminate them so they do not affect your scan results. If this is not done, those organ areas with reflections will not show correct scan readings-a major advantage of the FYEO PRO software over competitors. FYEO PRO – Scan Results Histogram – scan results generally show the average light intensity of a given organ area. However, what can happen is that in a given organ area, for example the liver area, there can be a dark chronic area as well as light areas that can give an inaccurate false reading and show that the area average is normal. With the new Scan Results Histogram function an exclamation mark will show up by the organ area if there is this discrepancy and you can quickly view how much percent of that organ area is composed of degenerative, chronic, pre-chronic or acute tissue. This reduces false readings and makes the FYEO PRO Scan miles ahead in accuracy with any scan software that is available in the world today. 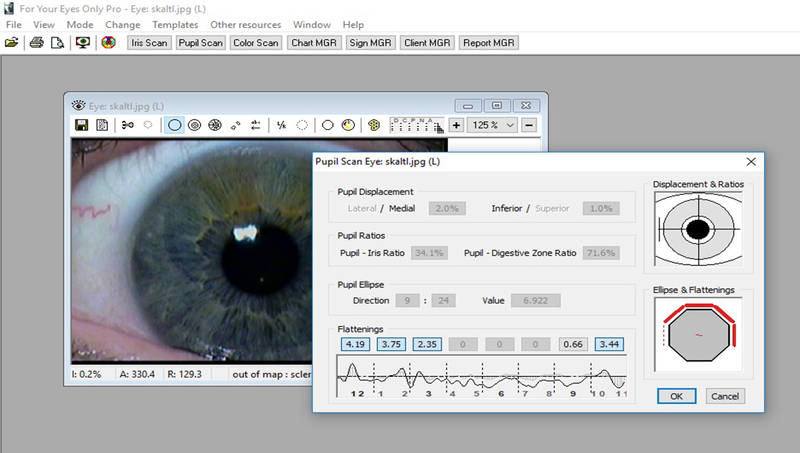 FYEO PRO – Pupil Scan – within seconds lateral, medial, superior or inferior pupil displacement is calculated, pupil /iris size ratio, pupil/digestive ratio and pupil flattening is displayed to provide instant information about the pupil automatically to the report like no other iridology software in the world. FYEO PRO – Pupil Border Detector – with this function, the precise border of the pupil is detected allowing the pupil scan to accurately provide information about any pupil flattening that may not even be visible at first to the human eye. A fantastic feature that once again establishes the FYEO PRO software miles above the rest. 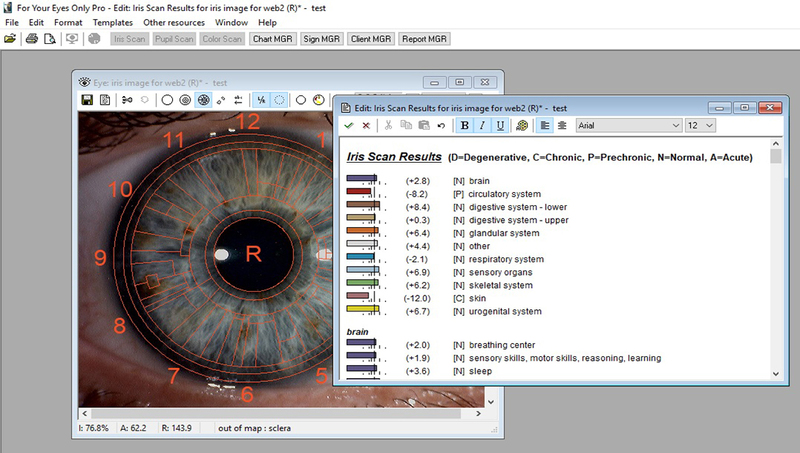 FYEO PRO – Color Scan – allows the user to identify colors found in the iris while the software automatically performs a color scan in seconds that identifies in which organ segments the colors are found and the percentage in each- another world first. 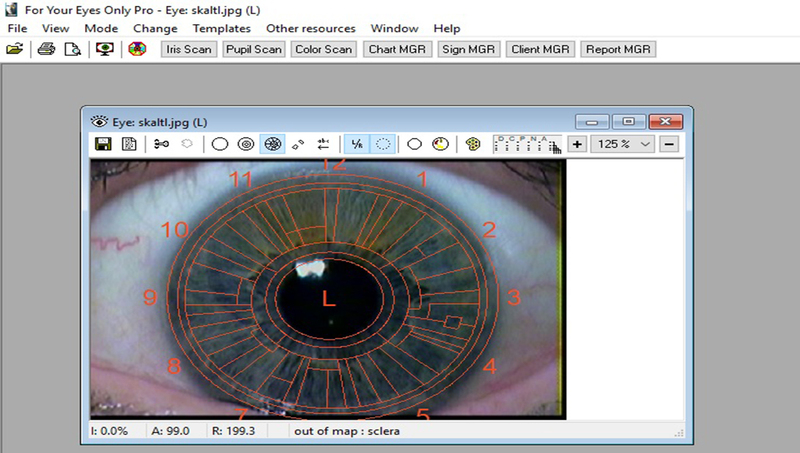 FYEO PRO – Chart Manager – a link between the iridology chart overlay and the report. 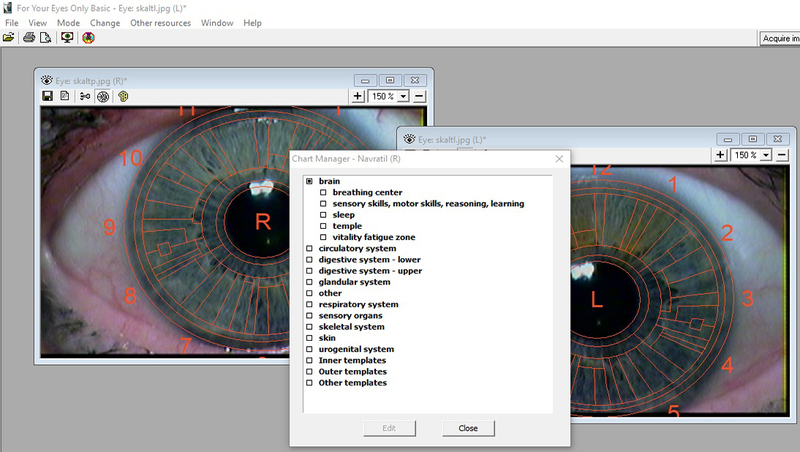 The software provides 2 data templates for each organ area of the iridology chart, including pupil and sclera areas. It allows you to input information about the organ, treatments, diets etc. and with a click of the mouse on the organ segment, all this information shows up in your report instantly. Right click allows you to add or edit these templates. FYEO PRO – Instant organ identification – never get lost when analyzing the iris. 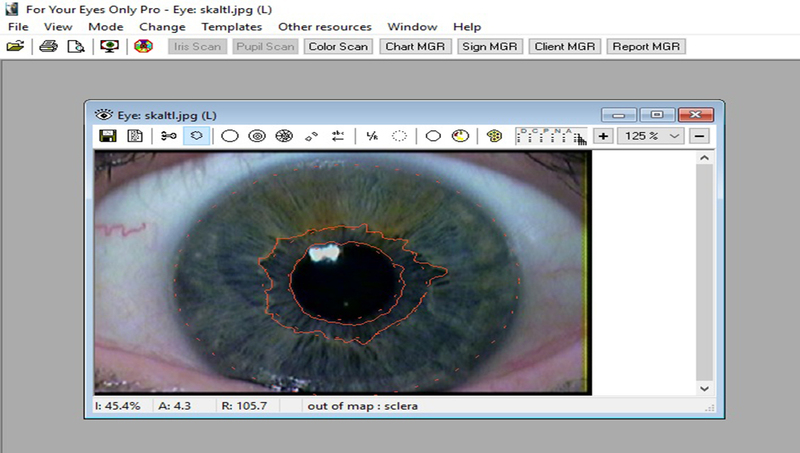 At any time just click your mouse on any area of the iris and the body system and organ will be instantly identified. 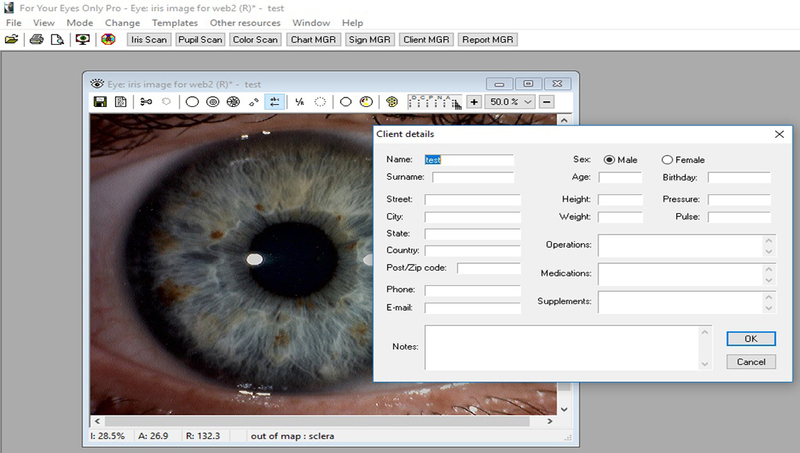 FYEO PRO – Instant light intensity identification – place your mouse on any area of the iris and the exact light intensity for that area will be displayed which identifies darker or lighter areas of the iris. 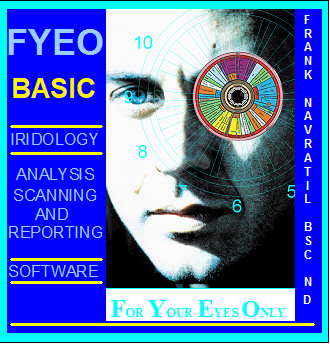 FYEO PRO – Iridology Sign Locator – another fantastic innovation allowing the iridologist while viewing the iris, to click on an organ area and use a menu to find the correct iridology sign in seconds. 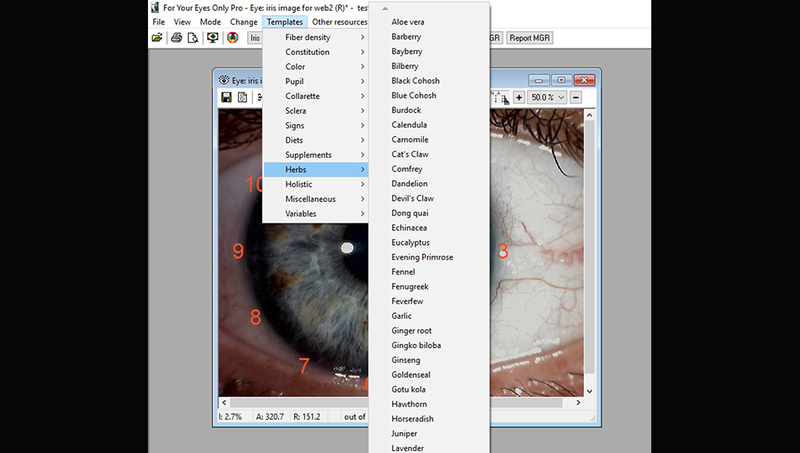 Using a drop-down menu with visual iris images, this is made extremely easy. Once the iridology sign is identified, the information is added to the report along with the exact location of the sign. Choose from hundreds of iridology sign templates that contain information that can be instantly added to your report. FYEO PRO – Iris Fiber Density Identificator – allows the iridologist to quickly identify the grade of iris fiber density that will automatically be added to the report along with an explanation. FYEO PRO – Genetic Eye Constitution Identificator – allows the iridologist to quickly identify the genetic iris constitution which will automatically be added to the report along with comprehensive information including Physical Iris Description, General health problems, Common Health problems in Childhood, Common Health Problems in Adulthood, Beneficial food, Beneficial vitamins, minerals, herbs and supplements and other nutritional and lifestyle advice. 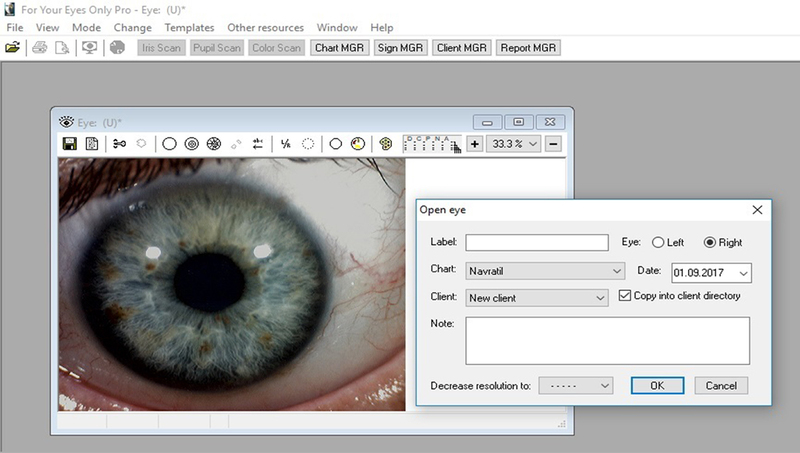 FYEO PRO – Sign Manager – choose from a variety of information templates that include iris, pupil and sclera signs or edit them and make your own personal templates easily and quickly. With just a click of your mouse, you can add your personalized pre-installed information anywhere in your report. With the FYEO PRO, all templates have been filled in with information and explanations, including hundreds of iridology, pupil and sclera signs and their explanations, genetic constitutions, diets, supplements, herbs, holistic and psychological factors. All of these templates can be edited or added to at any time, giving you complete flexibility to providing information and recommendations to your clients. 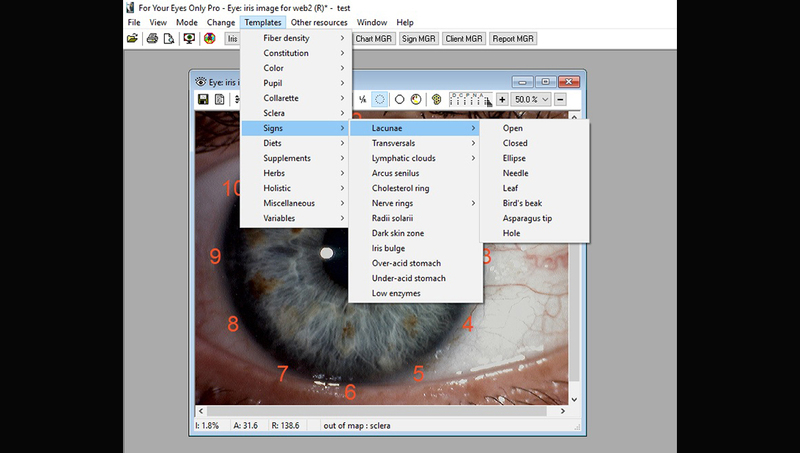 FYEO PRO – Report Manager with New FYEO PRO Iridology Wizard – The new FYEO PRO software includes the FYEO PRO Iridology Wizard that uses automatic prompting windows that guide you through the report producing process. 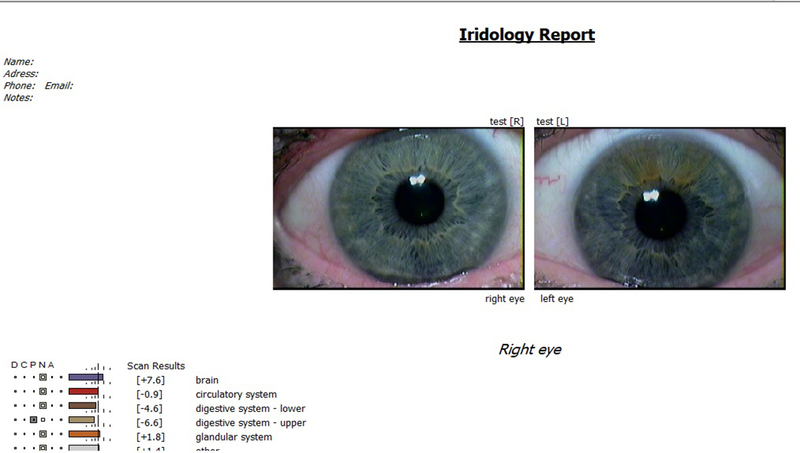 Creating iridology reports has never been so easy yet so comprehensive. The Report Manager function will guide you from the start where you import your iris images into the software all the way to printing your report. You can use the Iridology Wizard to choose between a Simple report that includes just client information, iris images, scan results and recommendations or a multi-page Comprehensive Report that includes no second guessing and allows you to add client information, iris images, iris fiber density, genetic eye constitution, color scan for the right and left iris, iris light intensity scan for the right and left iris, pupil scan for the right and left iris, and allowing a visual inspection of both irises so you can add any additional information or comments. The Simple Report can be produced in less than 1 minute while the Comprehensive Report is possible to produce in less than 5 minutes. The FYEO PRO Report Manager and Iridology Wizard provide the iridologist a unique opportunity to provide substantial information to the client in the shortest possible time. FYEO PRO – Client Manager – manage your entire client database with one easy software tool. The Client manager function allows you to store unlimited data on each client, including their scan results, reports, images, personal data, notes, treatments etc. 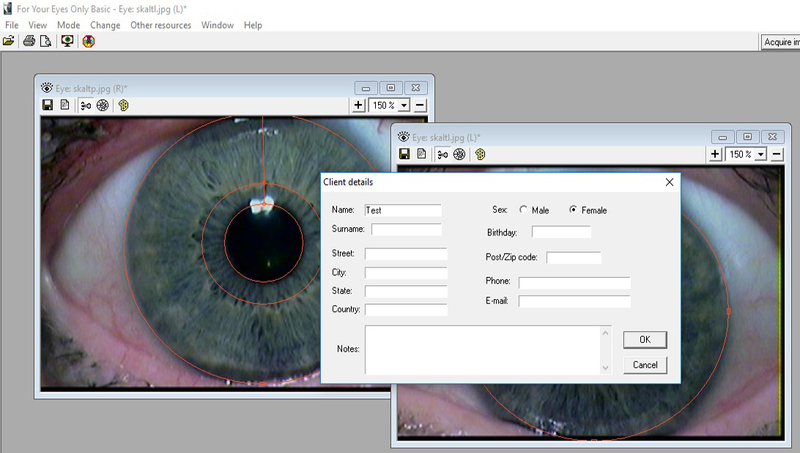 You can at any time, quickly look up any past client and view their irises, reports, scan results and other data. Managing your client database has never been so easy. 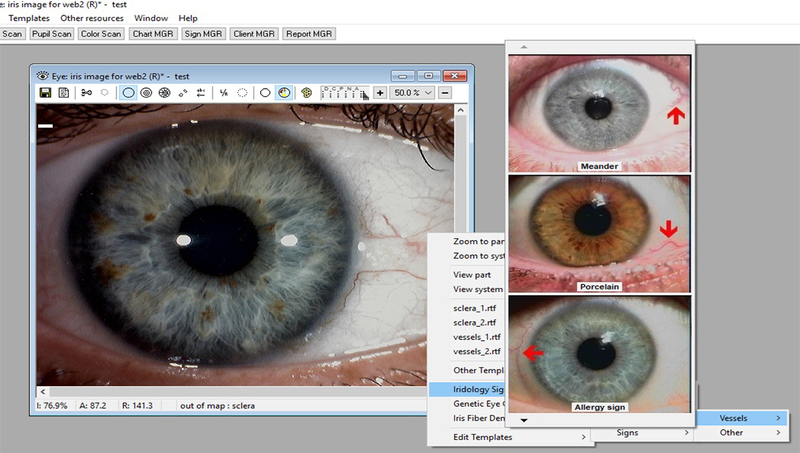 FYEO PRO – Iris Labeling – state of the art graphic tools are included to label your iris images. 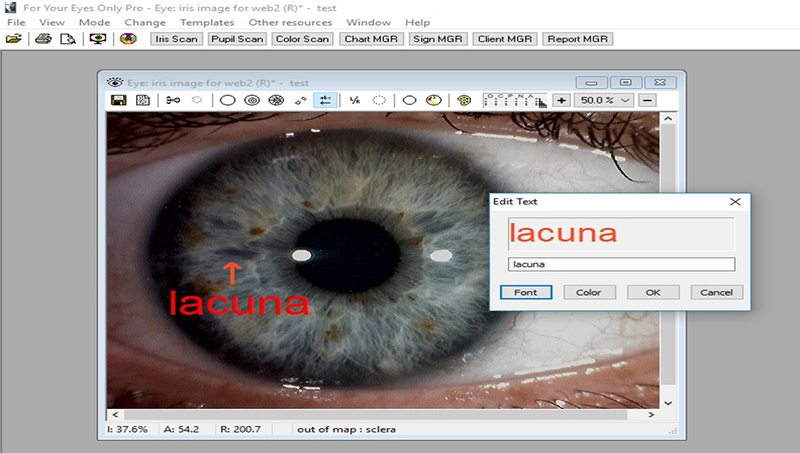 Add arrows or text to identify signs in the iris, pupil or sclera, easily and quickly. FYEO PRO – Invisible chart overlay – view the iris with an invisible iridology chart overlay, allowing you unobtrusive visibility while working and identifying iridology marks and signs or choose to work while a visible iridology chart overlay is in place. 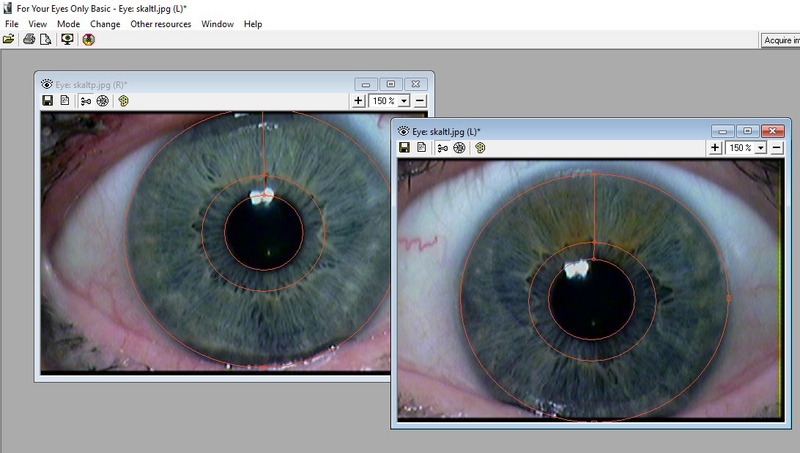 FYEO PRO – Zooming Tools – View the iris, pupil and sclera like no other software in the world. 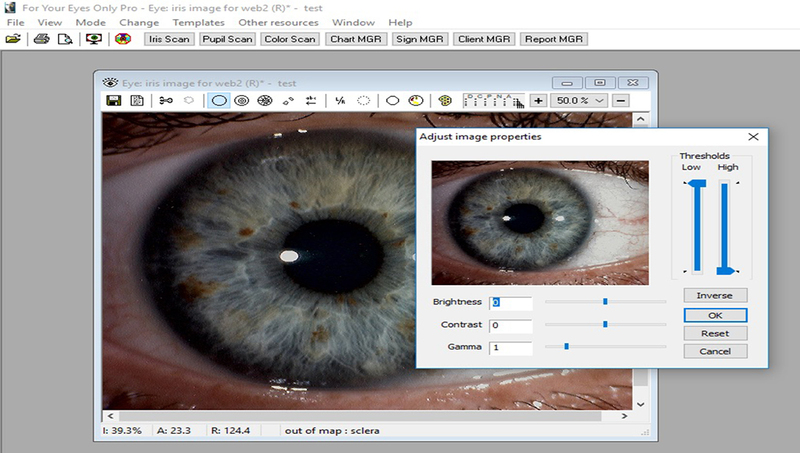 Zoom into your iris image for easier identification and analysis. View the iris on full screen to see it as large as possible. Use the View Segments function, which automatically highlights either any individual organ or entire body system comprising many organs. 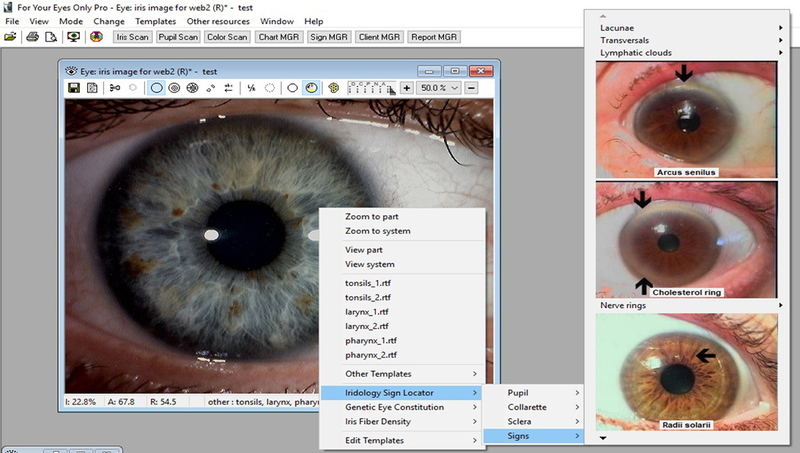 Zooming tools allow you to identify and zoom into view any organ segment. FYEO PRO – Printing and Sending Reports and Images – all reports and images can be easily printed and can include chart overlays, labels, text and arrows. The reports can be also be automatically emailed direct from the software. FYEO PRO – Scan counter – need to keep an account of how many scans are performed? this function is great if you have staff and need to make sure that all scans are accounted for.